The GNOSS Technology Service is a robust and complex technological infrastructure designed for computing intelligent data. Composed of a heterogeneous component set harmonised using a software layer, GNOSS Technology offers a range of ICT services with maximum security and efficiency guarantees. The emerging intelligent computation landscape is characterised by an immense inflation of data requiring interpretation. The creation and writing processes should produce natively intelligent data in a transactional style that machines can interpret and people can query naturally according to their own cognitive models. This requires unifying the digital processes of creation, writing and consumption, which should function in the future following technological logic. The pursuit of this challenging goal has steered the selection, integration and harmonisation of the set of components that constitute the GNOSS Technology Service. In practice, achieving this goal makes it possible for systems to inherently operate intelligently; intelligence operations are released from the constraints of simple analysis. “Intelligent data” means information that truly makes sense and has meaning. Representation models and algorithms turn raw data into useful ideas that can be acted upon. Intelligent data should be easy to interpret, and not just for people, but machines too. If they cannot, they are not intelligent. Extracting and collecting large quantities of data could be damaging if there is no overarching layer of intelligence with the ability to compute them. Artificial construction of intelligence associated with natural language processing, ontological interpretation of entities, and computation of their relationships on a Knowledge Graph containing intelligent data are all highly demanding processes existing on a massive scale, not just in terms of representation, but also calculation, consistency and machine learning. Satisfactorily addressing this situation demands different computation models than the ones currently established within the market. The GNOSS Technology Service emerged out of NoSQL systems and concepts. NoSQL is a set of approaches to the problem of quickly emerging heterogeneous computation, which presently represents less than 20% of databases yet is inevitable in the demanding context described. GNOSS’ technological infrastructure is an integrated whole built from computation software and hardware that is geared toward guaranteeing robust, performance-oriented, consistent reading and writing processes that ensure transactionality from Knowledge Graphs. Data is at the core of GNOSS; they are warehoused in various formats and managed by multiple systems that grant them the functionality and performance to suit any need. GNOSS Orchestra is responsible for coordinating highly available data flow among distinct clusters and guaranteeing robust, consistent processes. GNOSS web pages offer Human Computer and Information Retrieval & Reasoning services. Through the Knowledge Graph, the services foster users’ natural interactions though multi-device interfaces according to their own cognitive models. This is what makes it capable of reasoning and drawing inferences itself, and generally performing personal, non-administrated queries. What’s more, the GNOSS I+L Server offers content personalisation and recommendation services that function based on users’ profiles. Finally, they make it possible to publish structured data that may be consumed by third-party services or published in third-party locations as Linked Data. The GNOSS Security layer verifies that the user who requests or updates information holds the necessary permissions. This layer is also the gatekeeper for the application permissions used by ETL Services. A suite of intelligent services associated with natural language processing, the ontological interpretation of entities, their automatic consolidation in highly demanding Knowledge Graphs and natural querying systems on a massive scale, not just in terms of representation, but also calculation, consistency and machine learning. GNOSS is engaged in the Analytics for Everyday Learning (AFEL) project on the research and development of models for predictive evaluation, learning itineraries and strategy personalisation based on cognitive models activated in learning tasks. The GNOSS Analytical Tool registers and interprets traced online activity that produces learning, both in and outside the classroom, whether in a formal or informal context. It also acts on the content employed by users when they learn. GNOSS Learning Analytics places a Dashboard at the disposition of the groups of users, students, teachers, schools and education administrations whose tasks endeavour to maximise, intensify and accelerate learning. 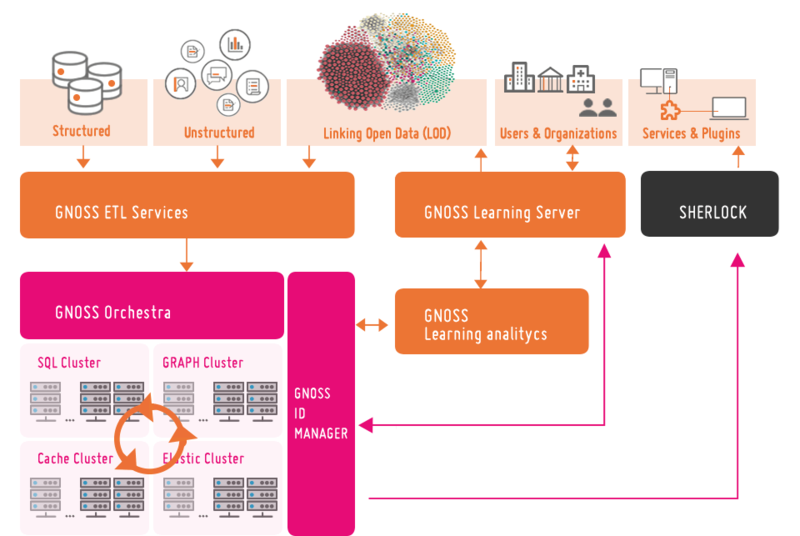 GNOSS Learning Analytics focusses on cultivating the most effective use of educational networks, platforms and resources and their private interests. Ultimately, cognitive algorithms, behavioural interpretation and natural language processing, together with the calculation models mobilised for this analytical project, are all extensible and significant to solving to a vast spectrum of analytical problems associated with learning and decision-making. GNOSS ETL Services is an API for extracting and integrating scattered heterogeneous data prior to their publication as semantically-represented content through Knowledge Objects defined with OWL ontologies. The data to be integrated may be structured or unstructured. Furthermore, this data may undergo a semantic enrichment process before it is published. Likewise, GNOSS ETL Services assists in the integration and consumption of Linked Open Data in the Linking Open Data cloud, all the while allowing organisations to share their information in that same cloud according to the principles of the Linked Data Web.